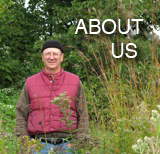 Published on Sep 24, 2012 by MARCKCMetro | Start by learning as much as you can about what plants are native plants to where you live. Then begin introducing native plants into your landscape a small section at a time. Removing weeds and occasionally trimming back plants are important steps in managing beautiful native landscapes, but you can significantly reduce the amount of area you’ll have to mow and treat with pesticides and fertilizer — saving you gas, money and time. You’ll also prevent releasing ozone-forming emissions generated by lawn equipment.